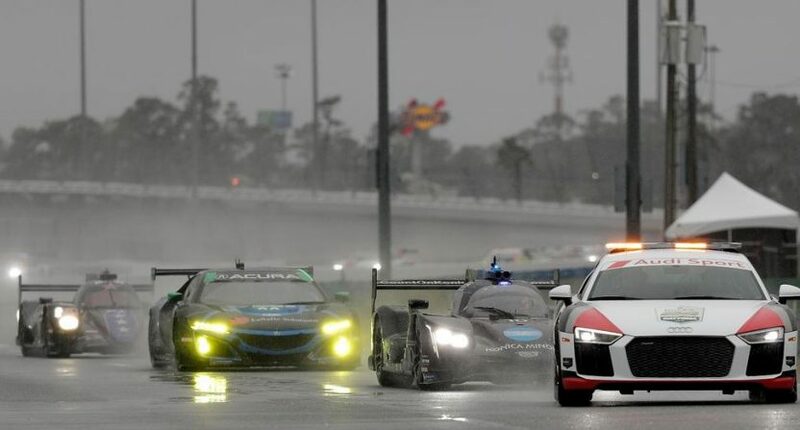 Two red flag periods and torrential rain determine the 2019 Rolex 24 at Daytona. In one of the wettest 24 hour races at Daytona, it wound up being a race of survival than performance. With so much standing water all around the track and the Daytona area predicted to get between three and five inches of rain throughout Sunday, some of the greatest racers in the world hydroplaned at various parts of the track just hoping they wouldn’t be slammed by another driver who also hydroplaned. In the end, it was the Konica Minolta Cadillac team of Fernando Alonso, Kamui Kobayashi, Jordan Taylor and Renger Van Der Zande who outlasted the rain and won the Rolex 24 at Daytona for Wayne Taylor Racing. NBC’s broadcasting duo of Townsend Bell and A.J. Allmendinger fared well pulling double duty in their respective teams. Both drivers led during various parts of the race and kept on the lead lap almost the entire race. Bell, who was driving for a new team with AIM Vasser Sullivan and Lexus finished third in the GTD class. Allmendinger, driving for his good friends at Meyer Shank Racing, finished fifth in the same class, both finishing on the lead lap. Allmendinger may have had issues remembering he was driving an Acura throughout the night but the team gave him a pass once he had them in the lead. This race was a tale of (roughly) two halves. The first 15 hours or so were a typical endurance race. And then once the rain hit in the morning, all hell broke loose. Over the final nine hours of the race, the vast majority of it was either under the safety car or a red flag due to torrential rain. The second red flag period resulted in the race being called nearly 10 minutes from the end of the race. This might have been less than ideal for fans but there isn’t much IMSA could do about that. If cars are hydroplaning and spinning out and drivers can barely see, it becomes a dangerous situation for drivers and the safety workers who are going out on a dangerous track to help those disabled cars. Imagine going out and trying to drive your car in flash flood conditions and how difficult that is. Now, imagine going 150 mph and doing the same thing. That’s kinda the situation the drivers were in. In the other three classes, the DragonSpeed team of Sebastian Saavedra, Pastor Maldonado, Ryan Cullen and Roberto Gonzalez won in LMP2. The Rahal Letterman Lanigan team of Augusto Farfus, Colton Herta, Connor De Phillippi and Philipp Eng win for BMW in GTLM. Yes, the “Letterman” in that team name stands for David Letterman, the retired late night host. And in GTD, the GRT Grassler Racing Team of Christian Engelhart, Mirko Bortolotti, Rolf Ineichen and Rik Breukers won in an Lamborghini. To follow up on some notable prerace stories, Alex Zanardi’s team may have won their class but his car unfortunately fell into early problems. Zanardi, who suffered a double leg amputation after a crash in 2001, had issues with his steering wheel that allows him to accelerate with the wheel in his first stint, putting the BMW behind the wall. They came back out and finished 18 laps behind their class winning teammates. The all-female team of Katherine Legge, Bia Figueiredo (formerly Ana Beatriz), Simona De Silvestro and Christina Nielsen were up in the top five at various points throughout the race but some late race trouble put them 13th in class, 11 laps behind the class winner. This may have been the most challenging race for all these drivers. While there wasn’t as much green flag racing, the conditions made it tough for them even under caution speed. While everyone would love to have seen the race end on the track, the conditions were a bit too tough and it’s all about keeping things safe. And for the class winners, ending the race early still means they get a Rolex so all is good with them.